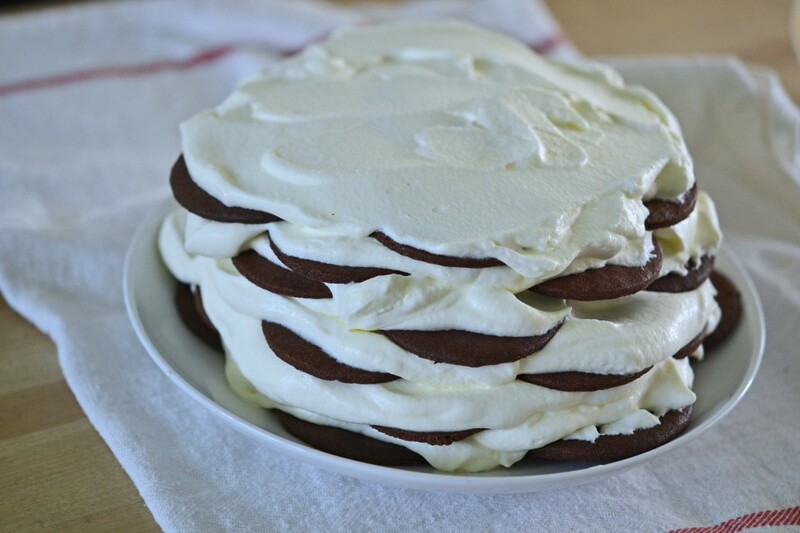 This classic recipe for icebox cake is made with gluten free homemade chocolate wafer cookies, and fresh whipped cream. The perfect summertime no bake cake! What is an icebox cake? 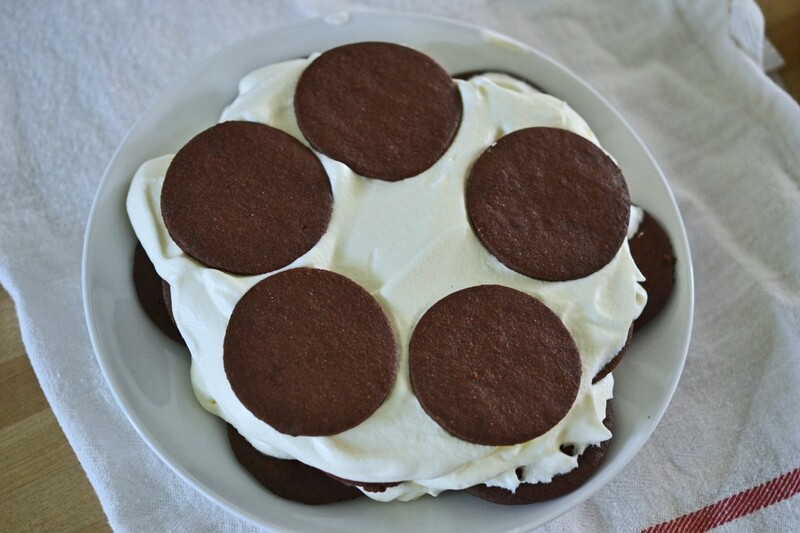 A classic icebox cake is a no-bake cake made of thin, crispy chocolate wafer cookies and whipped cream. Is it true that it’s called a “ripple cake” in Australia? Let us know in the comments, friends from Oz! It’s so-named because it’s made by layering the crispy cookies with fresh whipped cream then allowing them to set by chilling in the refrigerator for at least 8 hours. During that time, the whipped cream dries out a bit as it sits uncovered, and the cookies sort of melt into the cream. At the end, the cookies are no longer crisp, but they still hold their shape in all that delicious cream. There are so many ways to make an icebox cake. This way just happens to be my favorite. Can’t you just buy a package of gluten free cookies? There are so many great packaged gluten free products available for purchase these days. I had assumed that I’d be able to post a recipe for easy gluten free chocolate wafer cookies, and then be able to recommend a packaged product as well. I was willing to buy as many brands as I could find, and celebrate the very best. Imagine my disappointment when I realized that, no matter how much money I was willing to spend on the endeavor, there were no cookies to be found. I guess it shouldn’t be that much of a surprise. There aren’t even that many packaged brands of conventional chocolate wafer cookies. I think Nabisco might be it? 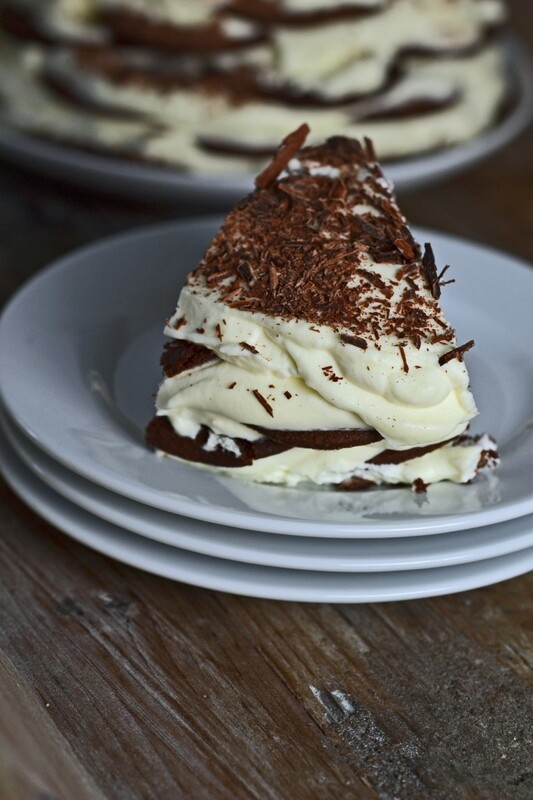 How do you make this icebox cake? My favorite way to make an icebox cake is the method you see here. I place round chocolate cookies in a single flat layer of 7, cover the gaps in the cookies with 4 more, and top with a layer of whipped cream. Then, I keep repeating the process until I have about 6 layers of cookies, 6 of whipped cream. You begin with cookies and end with whipped cream. Ending with whipped cream means that you can nestle some sliced (or whole) berries into that final layer. 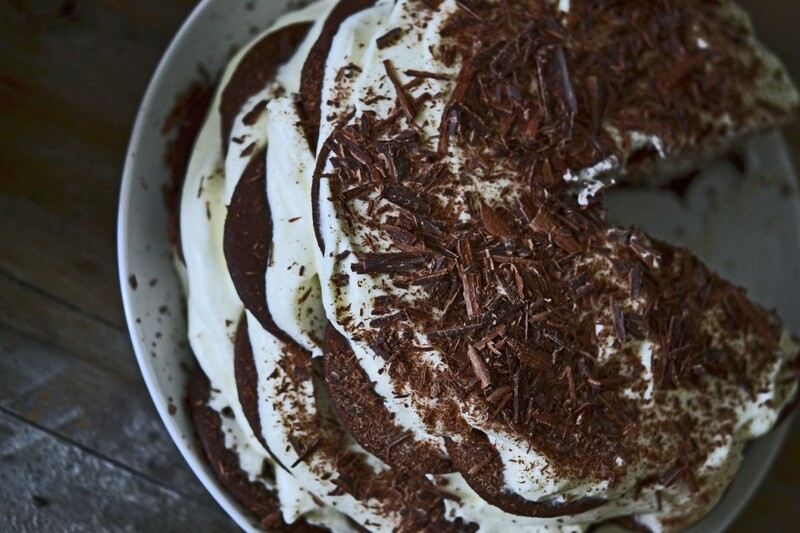 Chocolate shavings also work great. How else can you make an icebox cake? By posting this recipe, which is really more of a concept than an actual recipe, I aim to inspire you to have some fun this summer. Maybe you have fond memories of making icebox cakes as a child, or with your own children, and feel like those days are gone forever, now that you’re gluten free. I am here to remind you that, however you used to make icebox cakes, you can make them still. Maybe you layered a few vertical stacks of cookies and whipped cream, then lay them on their sides in a loaf pan with a layer of whipped cream below and above. Be sure to line the loaf pan with plastic wrap first. What’s your favorite way to make an icebox cake? Let us know in the comments. If it’s a family secret, we won’t tell! Dairy-free: It might seem difficult to make a 3 ingredient recipe, one ingredient of which is whipped cream, dairy-free. But it isn’t! You can replace the heavy whipping cream with whipped coconut cream. You’ll need the cream from a can of full fat coconut milk. Simply refrigerate the can of coconut milk overnight, then discard the liquid from the can (or reserve it for another use). Treat the coconut cream much the same as you do the heavy whipping cream. 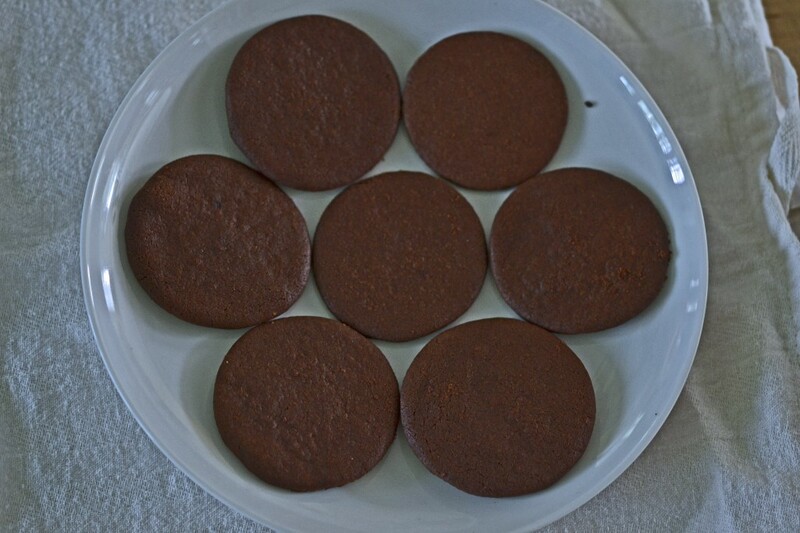 The chocolate wafer cookies can also be made dairy-free. Just take a look at that post for those instructions. Egg-free: The chocolate wafer cookies contain an egg in the ingredient list, but since it’s only one egg you can likely replace it with a “chia egg” (1 tablespoon ground chia seeds + 1 tablespoon lukewarm water, mixed and allowed to gel). Sugar: There’s very little sugar in the whipped cream, and you can try replacing the granulated sugar in the chocolate cookies with a granulated sugar substitute. Again, see that post for a full explanation. Place the heavy whipping cream in the bowl of a stand mixer fitted with the whisk attachment or a large bowl with a hand mixer. Whip the cream on medium-high speed until soft peaks form. Add the confectioners’ sugar, and continue to whip until the whipped cream holds stiff, glossy peaks. If you over whip the cream at all and it looks curdled, add a tablespoon more of chilled cream and whip until smooth. On a large flat serving dish or cake plate, arrange 7 chocolate in a circular pattern, with one cookie in the center, making sure that the cookies are close enough that their sides touch. Place another 4 cookies on top, overlapping the other cookies to create a nearly opaque single layer of cookies. Place about 1/2 cup of the whipped cream on top of the first layer of cookies, and carefully smooth it out in a single, even layer. Top with another set of 7 cookies, staggering each cookie in the second layer so that it is positioned on top of half of each of two adjacent cookies in the layer below. Add another 4 cookies in a similar fashion to before. 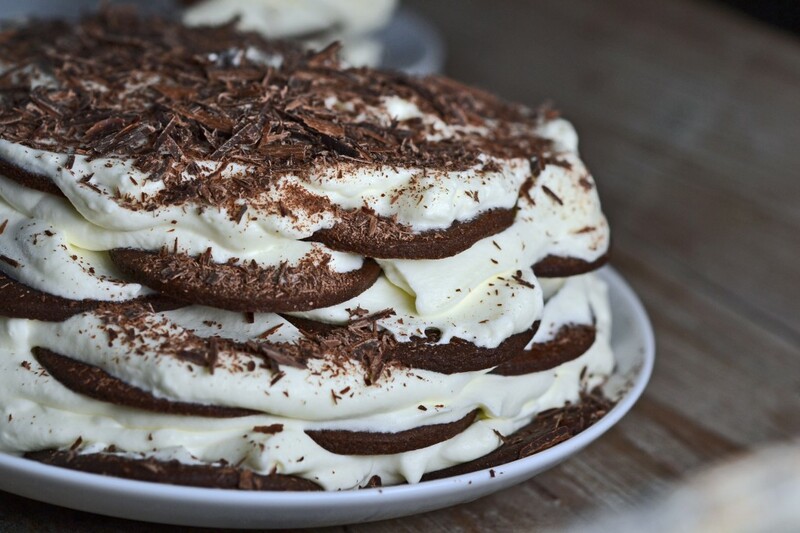 Repeat with layers of whipped cream, 7 and then 4 cookies, ending with a layer of whipped cream. 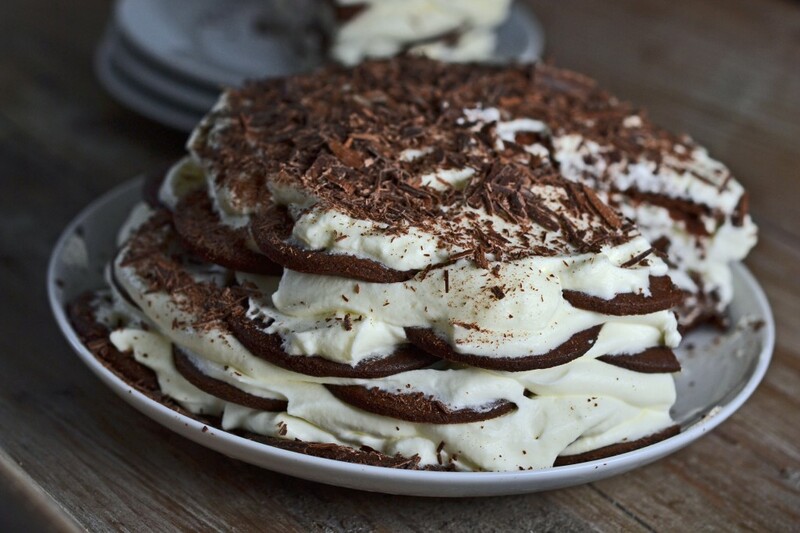 You should have 6 layers of cookies and whipped cream each. Place the cake in the refrigerator to chill for at least 8 hours or up to overnight. When you’re ready to serve it, remove the cake from the refrigerator and top with the optional sliced strawberries. Slice and serve chilled. Originally published on the blog in 2012 (!). Recipe slightly altered (increased amounts of ingredients for a more generous cake), photos and video new. Where is the r in for the lemon cakes? Yes, in Australia this is called a chocolate ripple cake, because it’s usually made from a particular variety of shop (‘store’) bought biscuits (‘cookies’) called Chocolate Ripple Biscuits. Delicious! Glad to have a GF version now – thanks! Your post caught my eye in Google reader this morning and I haven’t stopped thinking of it since. Giving up gluten meant the obvious (and obviously replaceable): bread, pasta, pizza, beer. But I hadn’t imagined having this family favorite until I saw your post – THANK YOU!! I grew up on this dessert but we called it Cookie Lert – the recipe came down from both sides of my family and now my daughter loves it too. She calls it Cooke Alert ;) Thanks for bringing a family treasure back to our table. We eat this at Thanksgiving and Christmas but I may have to give it a go this summer just to test it out, right?! I enjoy the web site and wonderful details. I am not sure how to contact the web person, as the blog community , can’t get a link sent with password. I had some issues with the pizza dough , and was hoping to ask my question. THe dough did not rise, but the yeast was good, not to hot or cold water, used a thermo. tried twice, about 105. Other breads i made turned out wonderful, from your site, just can’t figure out what went wrong. used food processor, thinking, maybe it didn’t get stirred up a lot. Made it into a ball, not to sticky. Just dense. thanks you, your blog is a gift. Thank you. It’s not really possible for me to know why your pizza dough did not rise. I would suggest reading this post about getting gluten-free bread to rise (about which I go into greater detail in My Cookbook), and this post with my Top 10 Secrets To Baking Good Gluten-Free Bread. This is a childhood favorite that my mother used to make, but she made it into a log-style rectangular loaf. Here’s how to do it: Using the above recipe, make stacks of cookies about 5 or 6 tall with whipped cream in between. Line the stacks up on a serving platter, reserving enough whipped cream to completely frost the log. Garnish with the shaved chcolate. When the log is sliced as you would a loaf cake, you see a pretty striped pattern. Okay, Dana, not being into whipped cream is just a language I do not speak. So crazy! I don’t understand this NYC heatwave. I don’t want to understand this NYC heatwave. It was meant to break, but now it’s not. It doesn’t care about us. And our cookies. And our ovens. Your website and recipes look amazing! I love this icebox cake and your Ice Cream Sandwiches! I hope you don’t mind, I wrote a post on my blog entitled, “What We All Miss Being Gluten Free” based on a conversation that happened on a facebook page I monitor. I posted a link to you Ice Cream Sandwiches. Of course I don’t mind, Hannah! Thanks for stopping by. I have never made or heard of an icebox cake. I clearly and most definitely have been deprived. Is this an East Coast thing? It really looks yummy! I love fun desserts. It’s not just an East Coast thing! I’m in Idaho and LOVE it! But, come to think of it. . . .I had it first with a family who is from the East Coast. Hm. . .
Daughter’s birthday this week and this is what I am going to make. Thank you! And by the way, the lemon bars with the True Lemon……….I can’t get enough of them! Good thing I actually have to take the time to make them. Love ’em!! Sounds like a great birthday, Patti! So glad you’re enjoying the True Lemon Bars. Thanks for letting me know! Good morning! Any thoughts on how to make the chocolate cookies in another flavor — perhaps lemon or brown sugar/butterscotch? My husband can’t eat chocolate (and yes, my celiac daughter says giving up gluten is easier). I can play around with the recipe myself, just wondered if I could benefit from your experience first! Wow. That’s a cross to bear for your husband, isn’t it? ;) I would suggest using my gluten-free ‘Nilla wafers instead of the chocolate wafers. They’re the perfect consistency. Just look under cookies in the recipe index, or use the search bar.